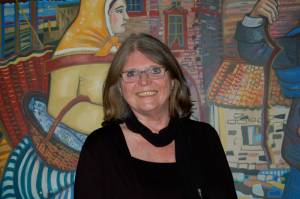 So far Alison Baillie has created 4 blog entries. I’ve been very bad about blogging recently (ie nothing since the end of May last year!) but since my wonderful son, John, has updated my website I’ve vowed post more often. One reason I’ve been so silent is that I’ve been working on my second novel A Fractured Winter, which is coming out on May 1st! I’m thrilled with it, published by the wonderful Mike Linane from Williams and Whiting, and with a fantastic cover designed by my friend, Alexander Huwyler. 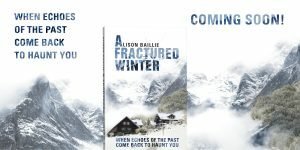 It is a haunting psychological suspense novel set in Switzerland, Scotland and Yorkshire which describes one winter when a young mother’s idyllic world begins to crumble. She thought she’d escaped her past, but it begins to catch up with it. I hope you’ll enjoy it! People often ask me where I got the inspiration for my first book Sewing the Shadows Together. The idea was in my head for many years before I actually wrote it, but it was inspired by a place that is very dear to me, Portobello, which i have already mentioned several times on my blog already! Portobello is the seaside suburb of Edinburgh on the Firth of Forth, with a wide sandy beach and a long promenade. This has always been a special place for me because my mother came from there and as a child I spent all my holidays at my grandparents’ house near the seafront. I later became an English teacher at Portobello High School and when my sons were young I also spent many happy hours playing on the beach there. It was at this time that the first seeds of an idea for my novel came to me. A tragedy which still hangs over the name Portobello took place when, in July 1983, a five-year-old girl was abducted from the prom by the serial killer, Robert Black. I wondered then how the family and friends of a murder victim could ever come to terms with such a terrible event and this formed the basis for my novel. I deliberately made the circumstances as different as possible, with a teenaged victim, a another decade and a completely different kind of murderer, but I kept the setting of Portobello as a very important element in the book. The book opens with the main character walking along Portobello prom, as I do every time I go back to Scotland and I miss it so much. Living in Switzerland, about as far as it is possible to be from the ocean, I long for the sound and the smell of the sea, the far horizons and the wide open sky. This week I felt so homesick that I went to Lake Constance just so I could look over the water and imagine that I was back in Portobello. It was nice but just not the same. I love going to book festivals and I’ve been fortunate enough to appear on the panels at several of them. 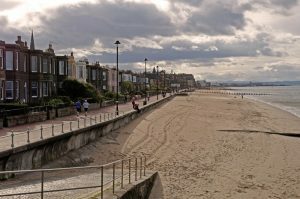 I was especially pleased to be invited to the Portobello Book Festival last autumn, because Sewing the Shadows Together is set in this beautiful seaside suburb of Edinburgh. This photo was taken there and I’m using it as an experiment as I attempt to learn the complexities of WordPress. Two years ago I didn’t even know what blogs were. After publishing Sewing the Shadows Together I realised how powerful bloggers are and because of their support people other than my family and friends read my book. Now my lovely son has made this website and I am just putting my toe into the murky waters of blogging. This is my test blog to see if it even works and once I’ve got my head round it all I’ll post more news!